Every JRPG fan’s pet peeve is this: You go into a weapon shop and start browsing, only to find a list of names with no other information or context. The only way to know whether those new weapons are better than your current ones is to guess. Here, now, is a compelling explanation for that annoyance. Shmuplations, a website that regularly digs up and posts English versions of old Japanese interviews, recently put up a piece about the role-playing game Phantasy Star IV, an all-time classic. Designer Rieko Kodama, who played a major role in Phantasy Star IV and many other Sega classics, offered some interesting takes here. One of those takes: Even in 1993, she felt like RPGs were getting too user-friendly. After all, don’t numbers ruin the illusion? The first thing we worked on for PSIV was getting the details of the world and setting solidified. Take a single candle, for instance: we asked ourselves, would that be something you’d find in this world? Is there electricity? Do the windows have curtains, drapes, shades…? Just a lot of little details like that. For the characters, we figured out most of their personalities as we drew them. With each detail and bit of background we added to the characters, the story itself also expanded. The world of Phantasy Star IV came into view for us very incrementally. During the game, however, those backstory elements aren’t made explicit. Much of it is kept secret on purpose, which is an experience we want players to have. The Phantasy Star series takes place on a different world, in a different age, so we want players to be asking “I wonder what that is…?” while they play. When they first see an Android, we want them to ask, “what in the world is this…? !” That’s also why we titled this game “Phantasy Star: End of the Millennium” instead of “Phantasy Star IV”. I think recent RPGs have become too user-friendly. For example, if you buy a Battle Axe in a store, the game will plainly tell you that it gives “+20 power”. But I don’t like everything to be displayed in numbers like that. In order to preserve the integrity and illusion of the world we’ve so carefully built, I’d rather players just get an impression of the weapon being stronger because it is made of stronger material. We do display hit points, though, somewhat to my chagrin. Honestly, if I could have my way, I wouldn’t use any human language for the monster names, or names of towns and places. I mean, Phantasy Star is the story of a completely different world, right? But of course, for players it won’t work to have a game that’s nothing but nonsensical, unintelligible words. I hadn’t really thought about it this way—I always assumed that when an RPG store doesn’t tell you whether weapons will make your characters better, it’s an oversight—so this is a fascinating take. 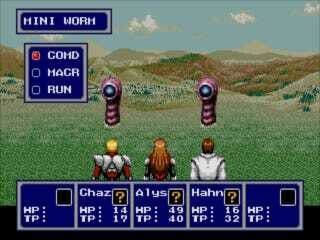 And of course, Phantasy Star IV remains one of the best role-playing games ever made, one you should still play today. For the rest of the Phantasy Star IV interviews, along with a treasure trove of other old conversations with Japanese developers, check out Shmuplations.